Back to the task at hand … Make a Wish, as you most certainly would have guessed, is named for the Make-a-Wish Foundation of Australia which grants wishes to children with life-threatening illnesses. $1.00 from the sale of each rose in Australia is donated to the Make-a-Wish Foundation. Make a Wish is synonymous with Petticoat and Petticoat Fairy Tale. It is a member of the Kordes’ Fairy Tale Rose series. Fairy Tale Roses are Kordes’ answer to David Austin Roses. The plants carry heavily-doubled blooms on vigorous, easy-to-care-for shrubs, with great disease resistance. Previous roses featured in Rose of the Week, Betty Cuthbert, Pomponella and Caramella, are also part of the series. Make a Wish is a floribunda rose. 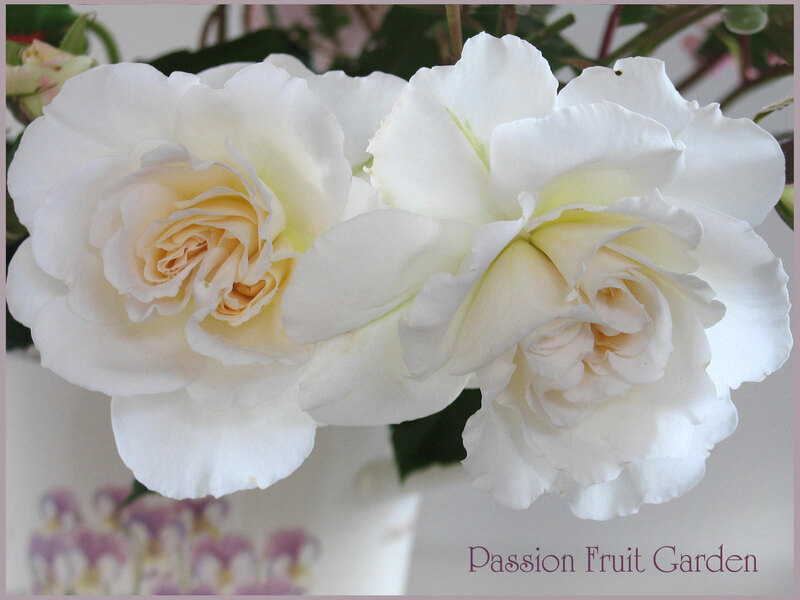 It has clusters of cream to white blooms, with a light but sweet fragrance. The blooms are medium sized (up to 6cm) and have 45 to 50 petals. The petals are lovely and ruffled – I can see where the name, Petticoat, comes from. It has medium sized, pointed, ovoid buds. Make a Wish blooms, in small clusters, in flushes throughout the season. Make a Wish is an extremely healthy plant. It has dark green, glossy foliage. Its growth is bushy and spreading. It, reportedly, grows to one metre tall and 900cm wide but mine is more like 900cm tall and a metre wide. Its growth is more like a ground cover rose, rather than a bush. It has been very hot here of late and I note that both the plant and the blooms are bearing up. Obviously, it copes well with hot, dry summers. Make a Wish was released in Australia in 2005. It was bred by Kordes in 1993 and released in Germany in 2004 as Petticoat. 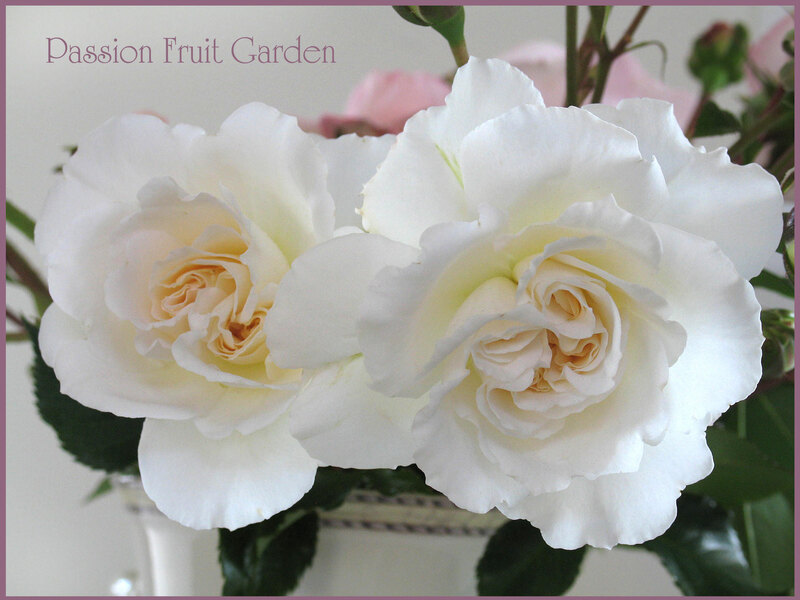 This entry was posted in Bush Rose, Floribunda Roses, Modern Garden Roses and tagged Kordes fairy tale roses, Kordes roses, Low growing roses, Roses with ruffled petals, White roses by Glenda. Bookmark the permalink. Lovely rose, and way to direct funds to a worthwhile charity. I really like the swirly, almost double centres, which pleasantly do resemble petticoats. Ella, I love the centres too. They are described as apricot but I think that is taking cream a bit far. Beautiful rose Glenda. I didn’t realize that the Make a Wish Foundation was outside of the States. it’s one of my favorite charities. Hi Diane. It is such a lovely cause.